NOTE: This is the first in a series of insight pieces drawn from the Measure of Success Alignment Survey (Summer 2013). We will be sharing others over the coming weeks and months. You can envision the metaphor: a mountaintop whose snowy peak juts above the cloud line. From base camp, the summit is shrouded, but we all know it is up there somewhere. The journey to the top will take some skillful navigation through cloud and fog. As you burst through the other side of the clouds en route to the summit, it all becomes crystal clear. At the lower levels of the organization, almost 40% of those “well down the org chart” confessed that the overall direction was not at all clear. 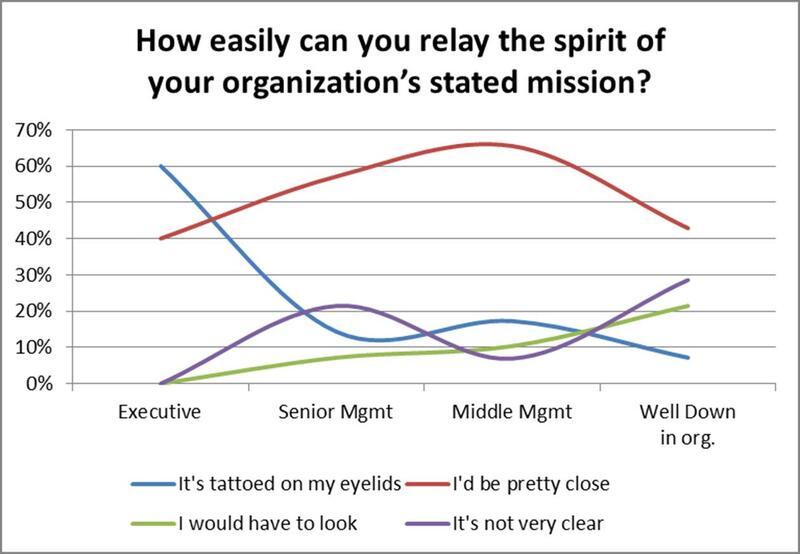 Across all levels of the organization, comparatively fewer people said they would “have to check,” which could suggest that the spirit of the orientation is seen as more important than the actual wording of the formal policy statements (or tattoos). 1 – Why is it clearer at the top? Picture your boss (or even better, your boss’ boss) coming by and asking if you needed any clarification on organizational direction. The path of least resistance and minimal downside is to answer: “No worries here, Boss. I get it.” The dynamic is often such that suggesting that you are not clear poses risks in two areas: (1) you are seen as simply not “getting it,” and (2) you are forced to overtly challenge longstanding assumptions. For those with even a modicum of political savvy, neither is a smart move. 2 – For overall direction, is “pretty close” close enough? 3 – Are the trade-offs apparent outside the trenches? One of the classic trade-offs in servicing clients is: do we give people what they want or what they need? Obviously the salesperson’s role is to bridge those worlds, but what if we can’t do both? If we are in the business of exceeding customers expectations and our customers have unreasonable expectations (or are not willing to pay to have their expectations exceeded) the objective becomes untenable. One may not see this disconnect from the heights of the executive suites. If the overall aims of the organization are overly fuzzy, so will the means to achieve them. Establishing the connections that drive performance is vital, otherwise in the spirit of reaching a workable solution with an external partner, we risk unknowingly compromising on something that is fundamentally important. Often in such collaborations, something has to give. Let’s make sure it’s not a fundamental attribute of performance. In working across divisions, the nuances of what takes priority can get lost when “everything is mission critical” and there is no time to think. Subtle differences in focus on what it takes to be successful can cause drag on performance. To a large extent, this drag is avoidable if we can get clear on what really drives the organization’s success. Rather than an eyelid tattoo, we can create a shared focus for the talents and energies of those driving your success. Click here for more information on this survey and the services we provide. This entry was posted in Clarifying the Story, Uncategorized and tagged Alignment Survey 2013, Collaboration, Schulich School of Business, Supply Chain on July 25, 2013 by chris493.